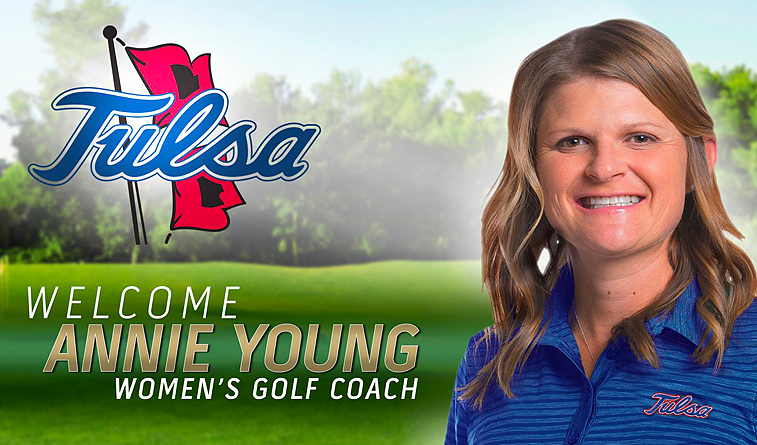 TULSA, Okla. –– The University of Tulsa announced today the appointment of Annie Young as the school’s head women’s golf coach. A former Oklahoma State All-America golfer, Young comes to Tulsa from Colorado State University. Young spent the past five years as the CSU women’s golf coach, where that program made improvement each year under her guidance. In 2017-18, Young led the Rams to the school’s best conference finish since 2010 with a third-place performance at the Mountain West Championship. In her fifth year at CSU, Young set new highs in both team and individual records as junior Katrina Prendergast finished the season setting the program record with a career-low 73.56 average in 2017-18. Colorado State finished in the top-5 five different times during the 2017-18 season, including finishing third, four different times. CSU had two individual qualifiers at the NCAA Austin Regional with Prendergast and sophomore Ellen Secor. In 2016-17, Young helped Prendergast score a 74.31 average and a career-low round of 67 at the Juli Inkster Spartan Invitational, which was her second career 67 and was tied for the lowest in single-round school history. Secor finished in the top-20 five times her rookie season and finished with a 75-scoring average. Young’s team also had a 3.78 GPA in the fall of 2016, which was the highest among all CSU teams. In her first season in Fort Collins (2012-13), Young led the Rams to six top-10 finishes, the most by a CSU team since 2003-04 season. The Rams averaged 308.1 strokes per round, more than a two-stroke improvement from the previous year. A year later, CSU dropped 56 strokes and moved up two spots at the 2015 Mountain West Championships. The team shot the fourth-best single-round score in school history at the Bay Area Intercollegiate (2-under 286) and on the season held the fourth-best season stroke average in program annals (304.52). In her five seasons at Colorado State, Young’s players garnered 15 Academic All-Mountain West honors, in addition to five WGCA Academic All-American Scholar accolades. Young, who starred at Oklahoma State from 2001-05 and earned a degree in marketing, began her collegiate coaching career at OSU where she guided her alma mater for three seasons (2008-11). She then spent the 2011-12 season as the head coach at Cal State Northridge, before taking over the Rams program. At Oklahoma State, Young led the Cowgirls to a pair of top-10 finishes at the NCAA Championships, as well as the 2009 Big 12 Conference title. She coached OSU’s first NCAA women’s individual champion in 2010 when Caroline Hedwall took home the top honors, also garnering 2010 GolfStat Cup Player of the Year and NGCA Player of the Year accolades. Five players earned All-America honors under Young’s tutelage, including Pernilla Lindberg, who finished third at the 2009 NCAA Championships. Young’s impact as an instructor was also key for the Matadors in her one season at CSUN, as she guided her squad to three individual tournament titles, and helped Clariss Guce earn second-team All-Big West honors – the highest such honor for a Matadors golfer since 2008. One of the most decorated players in Oklahoma State women’s golf history, Young earned All-America honors in 2003 and 2005, earning first-team accolades in 2005, as well as being named the Big 12 Conference Player of the Year that same season. She was the individual medalist in leading OSU to the team title at the Big 12 Women’s Golf Championships and helped the Cowgirls to an eighth-place finish at the NCAA Championships. Young’s career also included a 2004 Big 12 individual title, and she was a three-time All-Big 12 performer (2003-05). In 2004, she helped OSU to a second-place finish at the NCAA Championships, which marked the best finish in Cowgirls golf history. As an amateur, Young competed in the U.S. Women’s Open in 2003 and led the United States to a win in the 2004 Curtis Cup. She won the 2002 U.S. Women’s Amateur Public Links Championship in Sunriver, Ore. The win also qualified her for the 102nd U.S. Women’s Amateur. As a professional, Young competed on the LPGA Tour, Duramed Futures Tour and the Cactus Tours, where she owns five career victories. Her husband’s name is Caleb.